The beauty of horror is that it caters to all moods: out of all the genres, horror has all different colours for us to paint its tapestry with. For many of us, it’s been a lifelong obsession since our childhoods, having grown up on Saturday morning cartoons, EC comics, Goosebumps books and video store B movies that would shape our tastes for the rest of our lives. Dead Peasants newest comic, Blood & Gourd, is a throwback to the days of being a 10 year old kid in front of the television, growing up on the films of Fred Dekker while reading Tales From The Crypt. At least for me, that’s the nostalgia it invoked. Inspired by Night of the Creeps and Return of the Living Dead, but not a zombie tale in the slightest, it retains the essence of what made those times special to us; yet the concept is so original and fresh it’s a breath of fresh air for modern horror. A summary of Blood & Gourd: It’s Devil’s Night in Olympia, WA- and out at Henderson Farms, the festivities are reaching a crescendo. Young and old have gathered to pick their own pumpkin, drink hot apple cider, and partake in the usual pumpkin farm fare. However, something has awakened from deep within the fertile soil. After years of abuse and humiliation, the pumpkins… are ready to pick us. You can beg! You can plead! You can scream! But these Hell’s lanterns are lit only with the burning desire to watch you die. 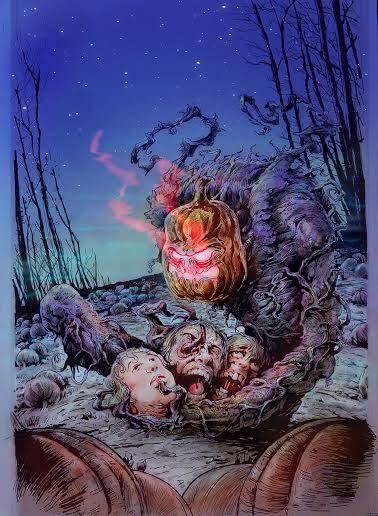 That’s only a brief teaser of all the delights in store in the first part of Blood & Gourd, but trust me when I say there’s more going on than pumpkins on a bloody rampage, hellbent on destroying a Washington farm festival. Co-creators, Jenz K. Lund and D.H. Shultis, have created their own unique myths and monsters in a wonderfully original and offbeat story that leaves questions unanswered, planting the seeds for something much bigger, while leaving us begging for more. The core of any good story, no matter what medium, is the characters we’ll be spending time with and storytelling. 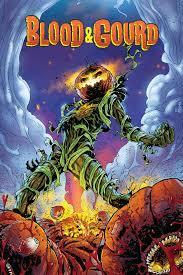 In Blood & Gourd, even the most minor characters are interesting. In contrast to the ridiculousness to the situation they find themselves in, every single one of them is well crafted and humorous; whether it’s reading about the mundane frustrations of family life; the dastardly plotting of corporate scum or the jealously of angry pumpkin farmers, it all contributes to creating strong identities. Even the characters whose purpose is to feed the pumpkins leave an impression. The dialogue, as frequently hilarious as it is, never feels forced and it brings a sense of realism and authentic humanity to the madness. Credit has to be given to the artists involved in bringing this wacky story to life: not only is every detail successfully accomplished, but they give it a vibrant cinematic quality that made me feel like I was watching it on a television screen. It takes talent and imagination to successfully pencil, colour and ink unrelenting chaos and these guys have it all in abundance. You can order your copy Here for just $6.99.